You are here: Home / Latest Golf Psychology Podcasts / Do You Struggle With Your Putting Confidence? Do You Have Confidence While Putting? 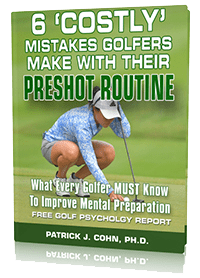 Dr. Patrick Cohn, golf psychology expert and author of the “Golfer’s Mental Edge” CD program, teaches amateur to tour professional golfers how to improve their mental game of golf using golf psychology strategies developed over the last 20 years of his career. Do you have two or three or more 3 putts a round? Do you struggle to make those dreaded 4 footers and in? 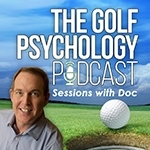 In this week’s golf psychology session, mental game of golf expert and author of The Mental Game of Golf, Dr. Cohn, answers a question from a golfer who struggles with his putting confidence. He is looking for a mental drill to help with his putting. Learn Powerful Golf Confidence Strategies! 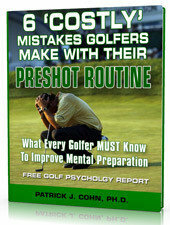 Are you making any “costly” mental game mistakes during your preshot routine? Download our FREE golf confidence report TODAY! Why your preshot routine should match your personality. How to develop a focused and consistent preshot routine to execute your best shot. The top mental game strategies your preshot routine must include. Why indecision is your worst enemy in golf. Six ways your mental routine breaks down. What are golfers saying about our mental game resources? “Last year at this time, my eldest son Martin fell 3m from a tree and broke both his arms. A little inconvenient for his golf and for his basketball. I took decided to subscribe to your site and undertake the kids focus program with him to take the opportunity to develop his mental side of sports.